The former Arp Schnitger organ (1699) of the Lutheran Church in Groningen. 1696: Consecration of the newly built Lutheran Church on november 28. The Arp Schnitger organ of Pellworm (Germany) from 1711. It is very likely that the appearance of this organ closely resembles that of the former Lutheran Church organ around 1718 (when a free pedal had been added by Garrels & Radeker). 'I built a small organ with one division and bestowed it upon the Lutheran Church in Groningen'. The church council however presented Arp Schnitger with 100 guilders, which prompted him (A.S.) to add a second division and three bellows. This imporant information was translated and published in 1854 in the magazine 'Caecilia' by organist Siwert Meijer of Groningen. In 1852 another article had already been published by Meijer in the same magazine about the enlargment of the organ with some more details: I (Siwert Meijer) have discovered information - in german - in documents left by the late Arp Schnitger that translates as follows: 'In the year 1699 I (A.S.) have built a small organ with a principal 4', one division and two bellows and donated it. The church however compensated me with 100 guilders which led me to add a substantial positive division and three bellows'. The list of stops that is added by Meijer reveals that the organ had a total of 16 stops, 9 on the great and 7 on the positive division. A solid wind chest is required to accomodate the stops listed above and additional stop and tracker action. Also, an extra bellow is needed, with the same dimension as the existing bellows. New trunks and conveyances will have to constructed and the existing three bellows and trunks need to be reconditioned. Assuming the organ builder will deliver all the materials and undertakes all the necessary work total costs are calculated at 525 guilders. Since transportation costs are never mentioned - something that is typically done in this kind of contract - it is virtually certain that Arp Schnitger already assumed that the work would be executed by Jannes Radeker and Rudolf Garrels, who had been working for his 'branch office' in Groningen for many years. It is also in line with the modus operandi for the organ in Pieterburen (1698) where Schnitger had shipped the essential parts from the Hamburg/Neuenfelde 'headquarters' and left everything else including the assembly to his local workers in Groningen. The pedal division can be placed behind the existing organ. Arp Schnitger recommends that extra isolating wooden panelling is installed on the wall behind the organ with a distance of about 9-10 cm. This will reduce the influence of moisture and prevent further damage to the instrument. The church is also expected to cover the costs for a handyman and a calcant while the work is being carried out. This proposal was dated 'Groningen the 29.X (october) 1710'. 1711: 'Should the planned pedal be realized inside two bass towers on both sides of the existing case, which is certainly possible as I have observed, then the planned Octavbass 8' must be changed into a Principal 8' made out of exquisite tin as it will be in the façade of the organ. The other stops will remain the same. In this case, two wind chests will have to be made to accomodate the pipe ranks for the pedal. Compared with the previous proposal, about twice as much material and labour is needed for the wind chests, tracker action, trunks and conveyances. This will increase the width of the organ by 4 feet on each side, so by 8 feet in total. As the existing organ has a width of 8 feet, the new total width will be 16 feet. This will not only greatly improve the visible presence of the instrument but it will also sound much better. All of this means extra costs of 250 guilders on top of the 525 guilders mentioned in the previous proposal, not including the costs for the additional work that needs to be done to the organ case. At your service'. Groningen, 2 Januari anno 1711. The execution of the second proposal by Arp Schnitger is delayed, most likely because of financial reasons. However, a fundraising campaign is initiated. A book in which the names and addresses of people who have pledged were administered has survived the ages. It reveals that even Jannes Radeker and Rudolf Garrels both signed up for 25 guilders. The close relationship of Radeker and Garrels with the church is also reflected in the following decision by the church council: 'The council has decided that Mr. Jannes Radeker and wife will be granted (named) seats for free in our church. In return he will take responsibility for the tuning of the organ'. The organist of the church at the time, Garlarus Benedictus Schofselaer, also committed himself for 25 guilders. Even local carpenter Herman Hölscher, likely an employee of Allart Meijer whose firm produced a lot of organ cases, donated 5 guilders. The campaign apparently did not directly end after the organ was rebuilt as the book shows donations at later dates, e.g. January 7, 1719. At the time the enlargement of the organ finally commenced, Arp Schnitger was living what would become the final years of his busy and fruitful life and had been heavily occupied with the building of a new 52-stop organ with three manual divisions in St. Michael's Church in Hamburg. This instrument was manufactured in the years 1712-1715 and Schnitger writes in his notes: 'An Gottes Segen ist alles gelegen' ('Everything depends on the blessing of God') and also: 'Nun der grossen Gott, in dessen Namen dies wird angefangen, segen das Mittel und Hilfe zum glücklichen Ende' ('may the great God in whose name we started this undertaking bless us and help us reach a happy ending'). Almost 70 years of age, the master anticipates being allowed to live to see the completion of his 'last' major work. 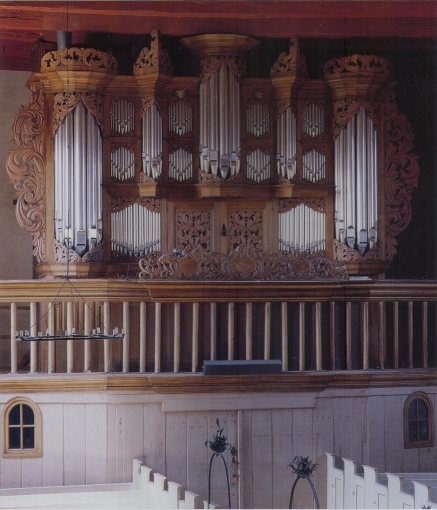 Two more new instruments would follow: a 29-stop organ (two manual divisions and pedal) in the Christ Church of Rendsburg (1716) and a smaller one in St. Paul's Church in Bremen. The latter organ was completed in the fall of 1718, the work primarily being done by his aides Gregorius Struve and Lambert-Daniel Kastens. The fact that Arp Schnitger more and more left new assignments to his accomplished assistants in the final years of this life is apparent from information from other archives. Signed among others by 'Arp Schnitger Orgelmacher' and the 'Kirchenvorsteher' (head of the church council). The issues surrounding the Rendsburg organ became even more pressing as Schnitger writes: 'I have suffered severe losses as my main aide at this location has been sick for a considerabe amount of time and finally passed away. Also my son Johann Jürgen burnt his hand, incapacitating him for six weeks. All of this caused the work to drag on, leading to lots of extra costs'. 'Dieses Pedaal ist aus liebe zu Gott und seiner Evangelischen Lutherischen Gemeinde alhier in Groningen von ettlichen Liebhabern verehret, im Jahre Christi, 1717. Durch Johan Radeker und Rudolf Garrels als Orgelmacher angefangen und verfertigt, zu der Zeit ist an dieser Kirche Organist gewesen Gerlacus Benedictus Schofselaer'. ('This pedal division was dedicated in the year 1717 AD by several devotees out of love for God and His evangelical lutheran congregation in Groningen. It was contracted and built by Johan Radeker and Rudolf Garrels during the period in which Gerlacus Benedictus Schofselaer was the church organist'). '20 jan. 1719, Dass wier Gott Lob, glücklich zu Hamburg arriviret seijn und haben unterschiedene Brieffe von fremden Ortern angetroffen, unb verschiedene Orgeln, zu reparieren item auch ein neues Werck zu bauen, aber der Vater hat Sie nicht acceptieren können'. ('January 20, 1719. Thank God that we arrived in Hamburg, only to find letters from various places with requests to repair several organs and also to build a new one. Father however could not accept them'). 2 tremulants and 4 bellows. The stops Bourdon 16' and Cornet 2' were not in the proposal by Arp Schnitger. The Nachthoorn 2' that was, was not built. The Lutheran Church of Groningen now possessed an organ by an exceptional master, that was the third largest in town (behind the instruments in St. Martin's and the Academy Church). The large four division organ of the Aa Church had been destroyed when the tower collapsed in 1710. However, pieces of this instrument had been salvaged and it is certainly possible that some parts were reused for the enlargement of the Lutheran organ. An agreement on this may have been made during the visit of Schnitger to Groningen in 1717. In the years that followed the organ was cared for by the successors of Arp Schnitger, Frans Caspar Schnitger, Albertus Anthoni Hinsz, Frans Caspar Schnitger Jr., Heinrich Hermann and Herman Eberhardt Freytag. In 1852 a 9-stop Rückpositiv was added to the organ. Now the Lutheran Church of Groningen boasted an instrument with 3 divisions and 32 stops! After the 'Schnitger branch office' was finally closed in 1863 by Herman Eberhardt Freytag (who passed away in 1869 in Peize, 73 years of age), this execptional organ was looked after by others and ultimately replaced by another organ by the firm of Petrus van Oeckelen and sons in 1896. Thus the organ Arp Schnitger once donated to 'his' Lutheran Church ceased to exist. The remains of the Rückpositiv by Freytag were reworked into a separate organ with new manual and tracker action, new bellows and changes to the stops and ended up in Gasselternijveen where it was recently restored. 'There is no doubt that Arp Schnitger was one of the most famous and proficient artists of his generation' (Siwert Meijer, 1854).